A constellation is a group of stars that forms an imaginary outline on the celestial sphere, typically representing an animal, mythological person or creature, or god. The way that people name patterns of stars likely goes back to prehistory. Different cultures adopted their own sets of constellation. The list of what groups are recognized as constellations has changed significantly over time. Some have changed in size or shape. Some became popular, only to drop into obscurity. Others were limited to single cultures or nations. The 48 traditional Western constellations are Greek. They are given in Aratus’ work Phenomena and Ptolemy’s Almagest, though their origin probably predates these works by several centuries. Constellations in the far southern sky were added from the 15th century until the mid-18th century when European explorers began traveling to the Southern Hemisphere. In 1928, the International Astronomical Union (IAU) formally accepted 88 modern constellations. Since July 2008, Fermi’s Large Area Telescope (LAT) has been scanning the entire sky each day, mapping and measuring sources of gamma rays, the highest-energy light in the universe. The emission may come from pulsars, nova outbursts, the debris of supernova explosions and giant gamma-ray bubbles located in our own galaxy, or supermassive black holes and gamma-ray bursts — the most powerful explosions in the cosmos — in others. The 21 gamma-ray constellations include famous landmarks — such as Sweden’s recovered warship, Vasa, the Washington Monument and Mount Fuji in Japan — in countries contributing to Fermi science. Others represent scientific ideas or tools, from Schrödinger’s Cat — both alive and dead, thanks to quantum physics — to Albert Einstein, Radio Telescope and Black Widow Spider, the namesake of a class of pulsars that evaporate their unfortunate companion stars. How do we draw constellations? From Earth, stars in a constellation appear to be close to each other. We tend to think that the stars are all at the same distance from us. But it’s an illusion! In most cases, the stars of a constellation are located at different distances. 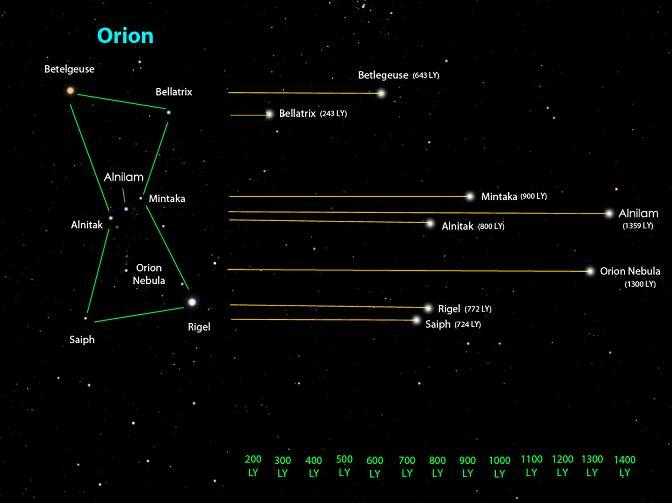 Let’s look at Orion the Hunter. Can you tell which star is the farthest? Which is the closest? Red-colored Betelgeuse (upper left shoulder) and blue-colored Rigel (lower right leg) are the two brightest stars of Orion. Yet just because a star is the brightest, doesn’t mean it’s the closest. You can’t tell its distance based on its appearance. There’s 6 trillion miles in one light-year. The closest is Bellatrix, the upper right shoulder star, at a distance of 243 LY. HS-ESS1-1. Use informational text to explain that the life span of the Sun over approximately 10 billion years is a function of nuclear fusion in its core. Communicate that stars, through nuclear fusion over their life cycle, produce elements from helium to iron and release energy that eventually reaches Earth in the form of radiation. Stars’ radiation of visible light and other forms of energy can be measured and studied to develop explanations about the formation, age, and composition of the universe. Stars go through a sequence of developmental stages—they are formed; evolve in size, mass, and brightness; and eventually burn out. Material from earlier stars that exploded as supernovas is recycled to form younger stars and their planetary systems. The sun is a medium-sized star about halfway through its predicted life span of about 10 billion years. By the end of grade 12. The star called the sun is changing and will burn out over a life span of approximately 10 billion years. The sun is just one of more than 200 billion stars in the Milky Way galaxy, and the Milky Way is just one of hundreds of billions of galaxies in the universe. The study of stars’ light spectra and brightness is used to identify compositional elements of stars, their movements, and their distances from Earth. ESS1.B Some objects in the solar system can be seen with the naked eye. Planets in the night sky change positions and are not always visible from Earth as they orbit the sun. Stars appear in patterns called constellations, which can be used for navigation and appear to move together across the sky because of Earth’s rotation.